In one of my recent orders from CropStop, Haylie Jo allowed a jar of Sparkly Fluff to fall into the envelope...so I decided to try it out and tell you what I thought of it. Now, if you know me at all, you know that loose glitter is like Kryptonite to me! So I was a bit scared to open the jar! The fluff is not like glitter. It is dense and, well, fluffy! But it does glitter some. It is sort of like glittery flocking. 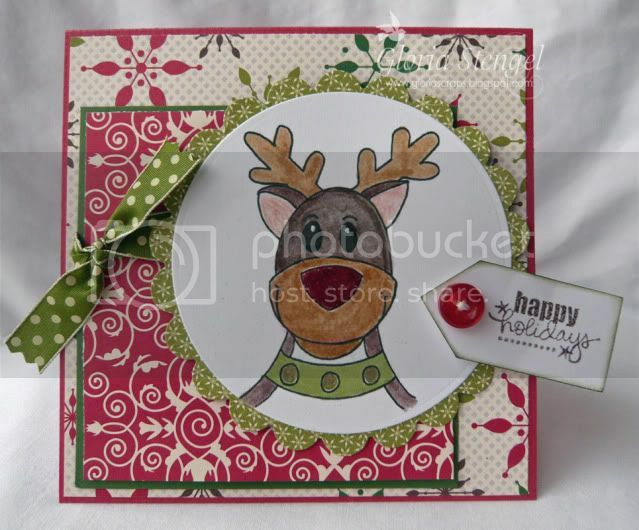 Here is a card I made, using the Very Cherry Red for Rudolph's Nose. To apply the fluff, I spread a thin layer of designer adhesive from Art Glitter onto Ruddy's nose. The tip of the glue bottle is very small, so you can sort of "draw" with it. This is a thick, white glue made for applying glitter. It dries clear. (I did try some other glues, but had the best luck with the Art Glitter stuff.) Once I had the nose filled in with glue, I used a craft stick to scoop up some sparkly fluff and tap it over the glue. I just piled it on and tapped the excess off the card onto some scrap paper. It's a little hard to see in the photo, but the nose is soft, fluffy, and sparkly! 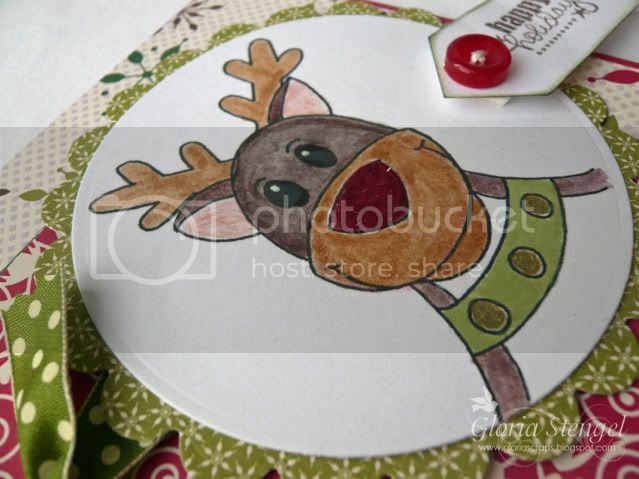 This stuff was as easy to use as embossing powder or (shudder) glitter, but less messy than glitter. The only note of caution is DO NOT try to dump the fluff out of the container the way you do embossing powder or glitter. You need to scoop it out. I is sort of packed in there and sticks together. You don't want to dump the whole jar in a big clump!